Follow - Like - Pin us on Social Media! This is a single piece tool to allow quilters to mimic our engineered corners regardless of how they cut triangles. The corners on all our tools are a special feature that allows quilters to align the fabrics properly prior to sewing. When proper alignment is accomplished the patchwork block goes together "perfectly" and the blocks lay flat. 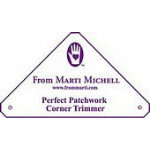 The Corner Trimmer let the user cut the special corners on any 45 or 90 degree angle fabric shape they wish. The Corner Trimmer includes extensive instructions for use in other quilting techniques.